And even now/when … years have passed/love has nothing to say … writes Vinay Dharwarker in his poem Waking, included in this anthology. Nevertheless, poets continue to address the issue of love, looking for novel and original ways to beat clichés. 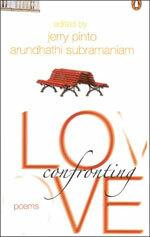 In Confronting Love, Indian poets writing in English try to make sense of this emotion. From the spiritual to the corporeal, from the whimsical to the brooding, these poems convey the myriad nuances of love. There is pathos here and ecstasy, obsession and resignation. There is, as the editors say, the being-in-love poem, the being out-of-love poem, and the regular tumbling-headlong-into-it poem as veterans and young talents alike seek to strike a balance between craft and feelings in dealing with the favourite theme of poets all over the world love.